WORTHING Cricket Club leg-spinner Mason Crane described his recent England Development Programme under-19 training camp in Dubai as a great experience. Crane, who also plays for Hampshire, was part of the group that trained at the state-of-the-art ICC Global Academy last month. The Worthing youngster has toured with the England under-19 squad before and was once again delighted to be part of the set-up. He said: “It was a great experience to train with the best for my age. “Everyone really developed well on the tour. With a clear focus on spin, it’s clear that the batters learned some really important things on the art of playing spin, and the spinners learned about bowling in subcontinent conditions. “The improvements the group made as a whole are there for all to see. “I really enjoyed being able to play outside in the hot sun at this time of year as well. The under-19 side played one match while on tour, which came against the UAE, with a mixture of first-team and fringe players from their 30-man preliminary squad involved. Crane managed to pick up two wickets and added: “I was happy to take two wickets against a strong side. “They put a really good team out and it provided us with a real test. 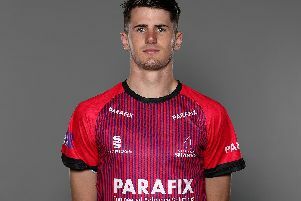 Crane got his first call-up to Hampshire’s first-team squad last year, when he was named in the 13-man squad for the Championship match with Worcestershire, although he did not make the final 11.